I have been lucky enough to come from a long line of excellent cooks. 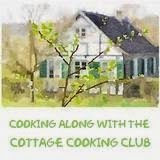 Cooks that have passed on essential skills, and treasured family recipes. My grandmothers were immigrants to this country and, both were amazing in the kitchen. My mother's mother came from Lebanon. She arrived at Ellis Island when she was just sixteen. Her traveling companions, for this very long journey, were her aunt and a cousin. Her uncle had previously paved the way. She would be staying with him and his family when she arrived in the U.S. A close friend of hers came to the pier to see her off. She handed my grandmother a handmade hanky, hoping she would never forget her. I still have that hanky. She boarded the ship and left behind her mother, father, and several sisters, along with everything she knew and loved. She was traveling to a strange land with hope for a new life, and with the knowledge she might never see her family again. She had with her a suitcase, the hanky, and a head full of family recipes. My grandmother, Labebe (Americanized to Jenny), was the heart and soul of our family. She was kind, wise, spirited and strong, our matriarch. Every once in a while, she would show her strong-willed personality. I remember my mother telling me a story about an old piano, which my grandmother wanted out of her house. She asked my grandfather, several times, to get rid of it. I guess he didn't move fast enough because my grandmother took a hatchet to the piano and threw the pieces out the window. My mother said it was quite a site, as she walked home from school that day. Funny, I can't imagine my sweet Imme with a hatchet in her hand. The recipe I'm sharing with you today is one of the recipes my grandmother brought with her from Lebanon. It was a staple in her house for as long as I can remember. Since my grandmother cooked from memory, a little of this and a little of that, my mother learned from watching her. She was able to come up with what we have today by combining what she saw with what we have read in Lebanese Community cookbooks. The Za'atar bread is made with the same dough I use for my "Fatayer Sabanegh" aka Spinach Pies. Take about a 1/4 cup of the dough and flatten it with your hands or a rolling pin. Mine are usually about 5 to 7 inches round. You don't want them too thick, as the dough will rise. 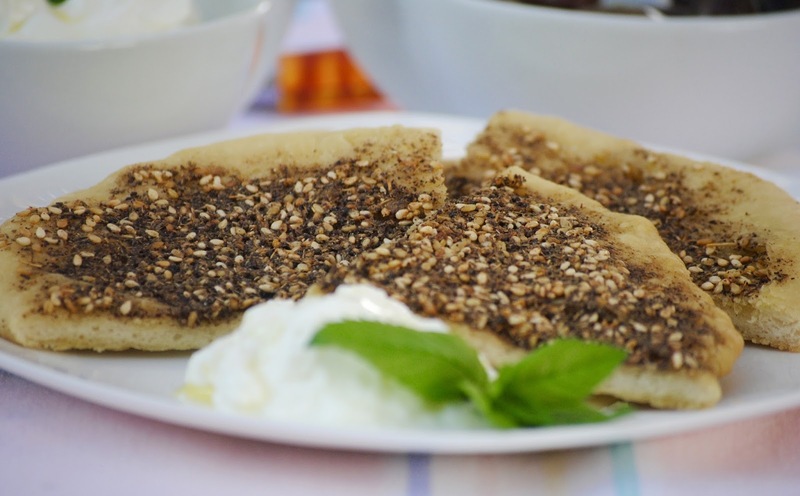 Spread the za'atar filling over the top, leaving about 1/2 an inch rim around the dough. Just like a pizza. Funny how this is still a family favorite, all these years later. I hope you'll give them a try. Serve with Labneh, (a strained Yogurt spread), olives, tomatoes, and cucumbers! I could eat this anytime of the day. My favorite lunch! I understand, in Lebanon, it is served for breakfast. I buy the za'atar already mixed at the Lebanese grocery. However, you can buy it on-line at Amazon or Olive Nation. 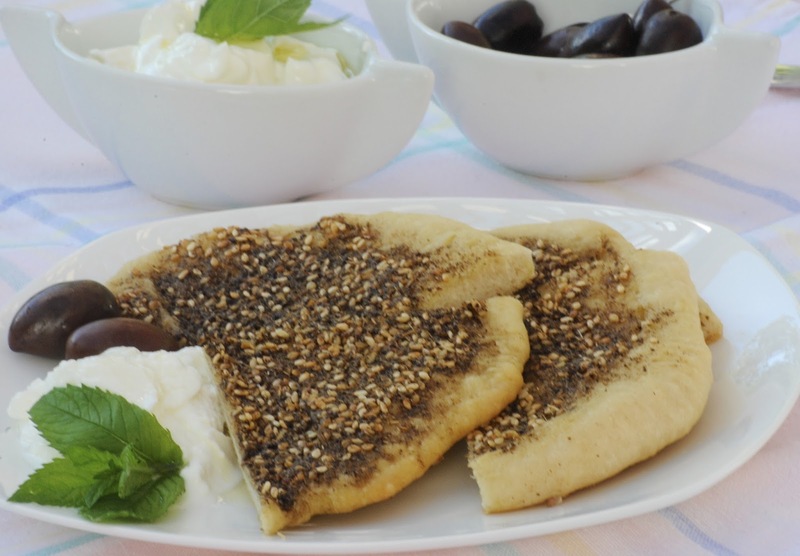 Olive Nation makes an excellent Lebanese Za'atar mix. 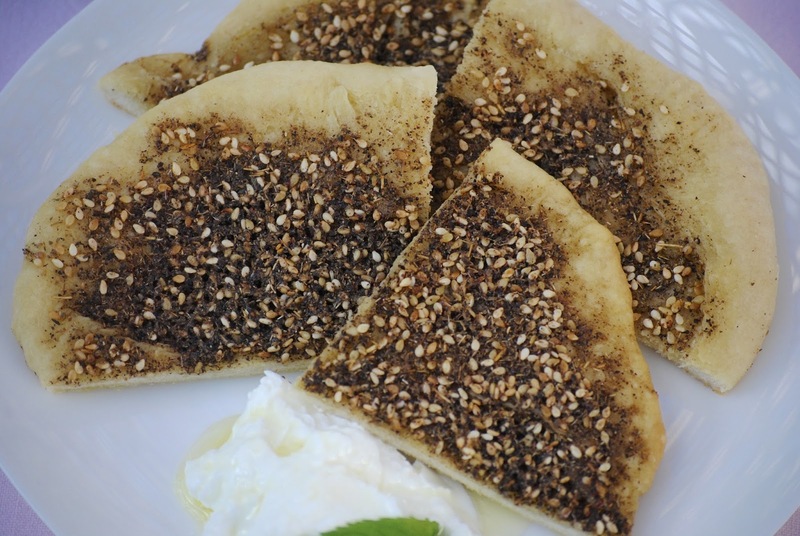 The ratio should be about 4 Tablespoons of Za'atar mix to enough olive oil to make a loose paste. Mix the flour and salt together in a large bowl. Then proof the yeast by mixing 1 cup of water, yeast, and sugar together in measuring cup. Make a well in the center of the flour and add the olive oil, yeast mixture, and the rest of the water. Stir till dough starts to come together, then turn out onto floured counter and knead until smooth and elastic. Shape dough, about 1/4 cup per piece, into rounds on a floured work surface. Arrange rounds on baking sheets and spread with za'atar mix. Bake in the preheated oven until lightly browned, about 20 minutes. I LOVE za'atar. Your flatbread looks wonderfully delicious. Thank you for sharing your family's recipe, Kathy. Beautiful post about immigration Kathy. My parents came here from France with 3 little girls in tow. delicious and easy to prepare. I am sure there is no worry about boring bread with this Kathy! My grandparents came from Denmark, my grandfather first, then my grandmother following with 3 kids in tow. They never saw their parents again, though they did get back to Denmark in their 70s. I am awestruck when I think of the bravery that immigration must have taken. How delicious, and what a wonderful story about your grandmother. I enjoyed reading about her very much. I can imagine how shocked your mum would have been to see the chopped up piano in the street. This is a great story about your grandmother, same in every immigrated family. 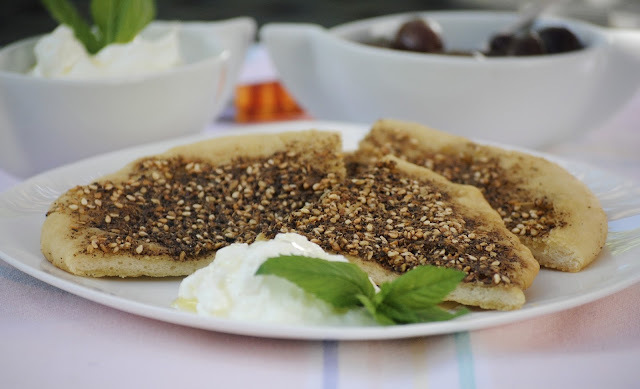 The Manakish/Zaatar Bread is my weakness and honestly I can live eating that alone with fresh cucumbers and field tomatoes and few sprigs of fresh mint. What a lovely post! I truly enjoyed reading about your grandmother, she sounds like a remarkable woman. And that bread looks amazing, I will be bookmarking this for later. Looks great, Kathy! And so funny that my post for Man'ousheh is coming up in several weeks. I think these are called Manaqeesh kathy, correct me if I am wrong. Anyways, Labebe was sure a courageous young lady, to leave her family behind and travel this long journey in such a young age, especially at this era!! she was def. a free spirit, you must be so proud of her. I hope she managed to see her family again. Very nice recipe, will be making this for sure.